Michael Dickson in action this season. The men’s tennis team is 15-6 on the season. Jimmy Lafakis/Collegian file photo. 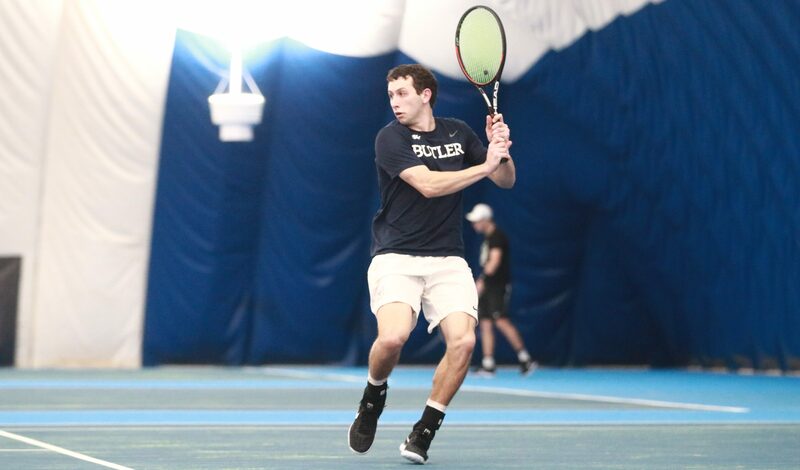 Both the Butler men’s and women’s tennis teams went 1-1 over the weekend in Big East play. It was the men’s first matchups in conference play this season against Villanova and St. John’s. The women nabbed their first win in conference play after they dropped their first two in the previous week. The men started the weekend against Villanova in a hard fought matchup. After battling for the doubles point, Mason Dragos and Ryan Roegner ultimately fell in the No. 1 spot 7-6. The Wildcats would go on to win in the No. 3 spot to clinch the point. Dragos rebounded by winning convincingly in singles play, with a 6-0, 6-1 victory in the No. 1 spot. Thomas Brennan and Michael Dickson were able to emerge as the victors in their respective matches. The Bulldogs first loss came at the hands of Aviv Ben Shabat, despite a hard fought battle that ended 5-7, 3-6. In the No. 4 spot, it was Adrian Mag getting the final win 6-4, 6-3, to give Butler its 15th win of the season. On March 30, the Bulldogs took on St. John’s but fell to the Red Storm 4-1. The Bulldogs were able to grab the doubles point behind a win by the Dragos/Dickson pairing in the No. 1 spot and Spencer Lang and Brennan in the No. 3 spot. But singles play did not fall Butler’s way, with losses coming in the 1, 3, 4, and 5 spots. The men now sit at 15-6 this season and play at Ball State on April 3. The women split their own pair of matches against Big East opponents. Their March 30 matchup with Providence proved to be very close. The Friars grabbed the doubles point with a win in the third set 7-6 in the No. 1 spot. Butler rebounded by battling in singles play. With straight set victories posted by Sara Linn (No. 2), Nina Bertino (No. 3), and Caroline McAuley (No. 4). With losses in the No. 1 and 6 spots, Lauren Marx sealed the win for the Bulldogs with a 6-4, 7-6 victory in her respected match. Butler took down Providence 4-3. The success did not carry over to the next day as Butler fell to Marquette 7-0. The Golden Eagles took the doubles point along with victories in the singles spots 1-3. While Marx gave a great effort in the No. 6 spot, she would ultimately lose in the final two sets. The women’s last regular season matchup takes place April 12 against Xavier. The team is now 11-12 this season.